Depth profile analysis by GDOES. 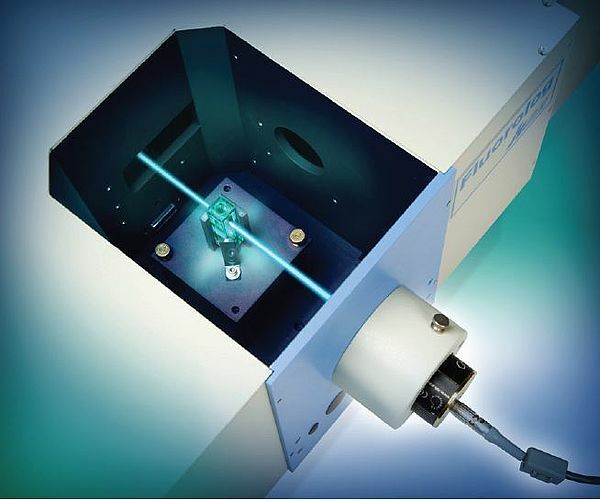 Pulsed RF Glow Discharge Optical Emission Spectrometry offers ultra-fast elemental depth profiling capability for the investigation of thin and thick films. 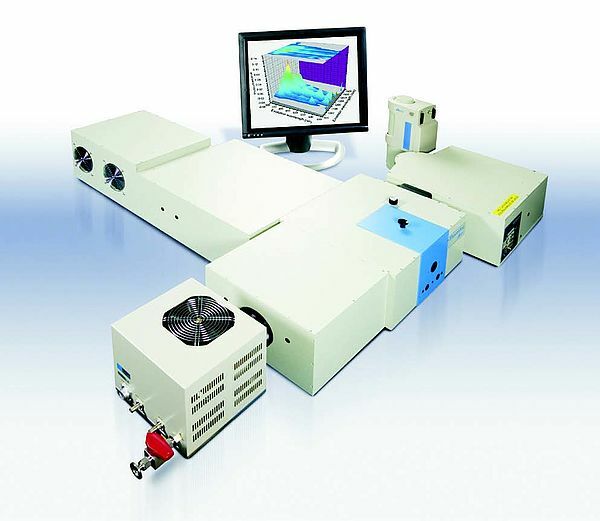 Thanks to the use of a pulsed RF source, coupled with a high resolution optical spectrometer, the GD Profiler 2 provides an excellent depth resolution, allowing the fast evaluation of the coating quality. 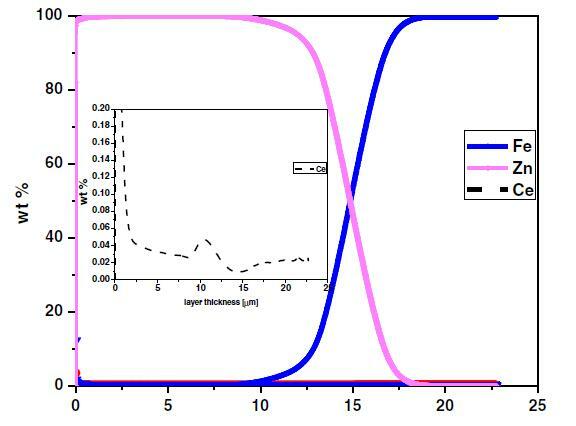 In this application note, we focus on a MoS2/Pb composite multilayered sample, used as a solid lubricant. 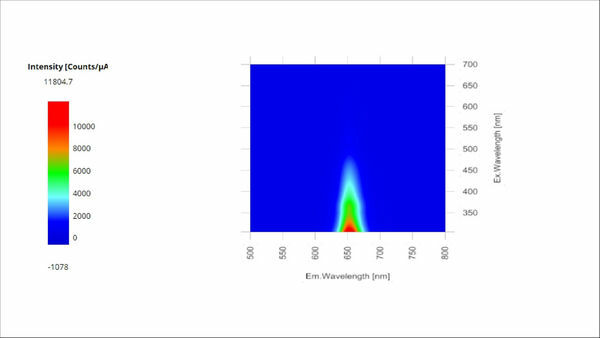 The analysis of such a sample shows the excellent performance of this instrument for the study of nm-thick complex coatings. Quantum dots (QDs) are semiconducting spheres in the size typically in the range of 1 to 10nm. The size of these small spheres give quantum dots the semiconducting properties and resulting photoluminescence that would not necessarily occur for the same material on larger scales. 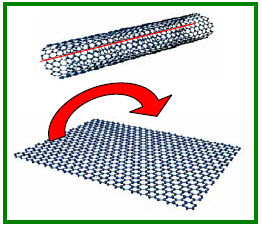 Single wall carbon nanotubes (SWCNT’s) consist of rolled up single sheets of carbon atoms and, due to the high aspect ratio and nature of the C-C bonds, have unique properties. 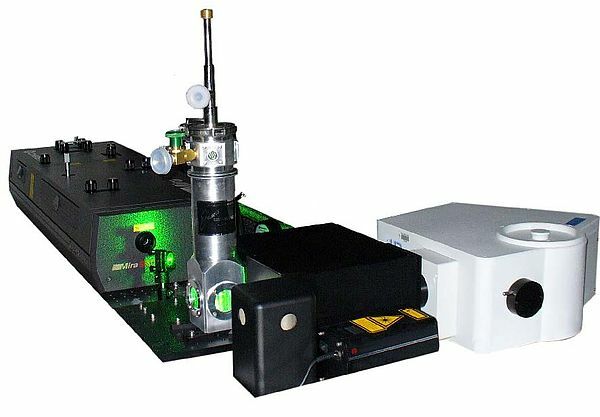 Dynamic light scattering (DLS) has become the technique of choice for characterizing nanomaterials in suspension due to its speed and ability to readily characterize a statistically significant number of particles. 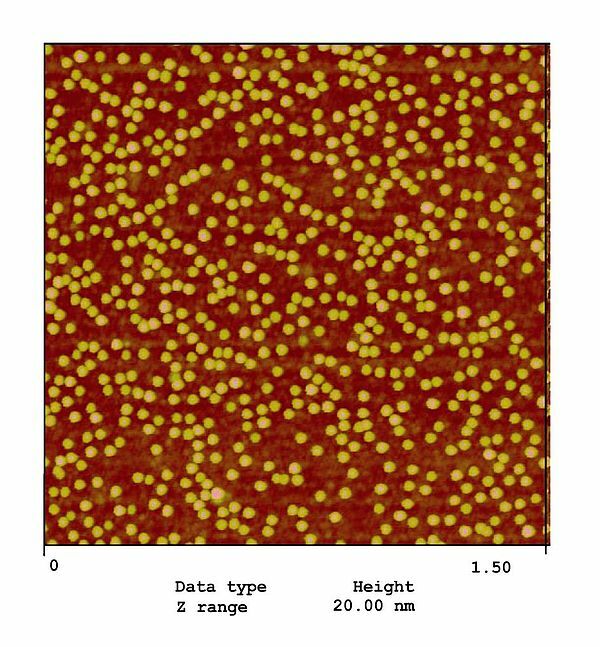 The abrasive particles found in CMP slurries have a size distribution which directly affects critical metrics. Particle size analysis is therefore a key indicator of CMP slurry performance. The popularity and utility of several particle sizing techniques will be discussed within. 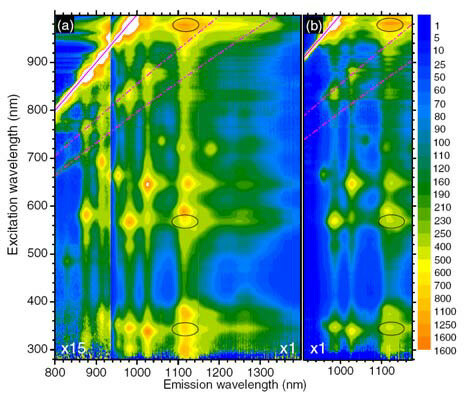 Upconverting lanthanide-based nanomaterials exhibit a unique fluorescence anti-Stokes shift, which enables them to convert NIR wavelength excitation into visible shorter wavelength emissions (NIR to UV-Vis). The use of metal surfaces in conjunction with fluorescence molecules employing a plasmon effect, sometimes referred to as metal enhanced fluorescence, can be advantageous because of the possible enhancement of photophysical properties. 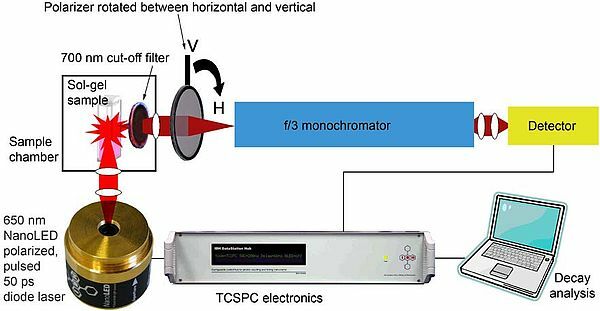 UVISEL ellipsometers have been used for the characterization of several systems of nanoparticles. 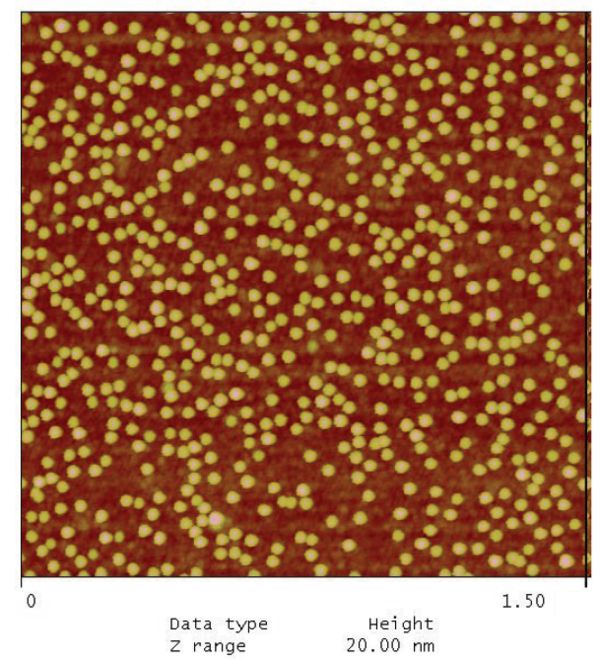 This ellipsometric characterization involves the development of specific modeling tools available within DeltaPsi2 software. 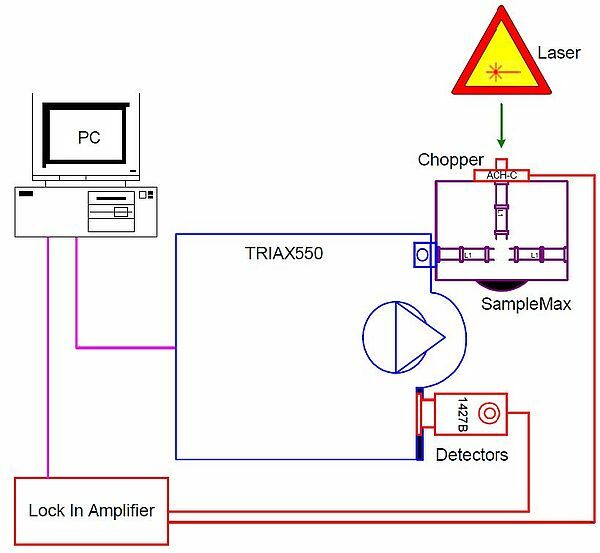 Through this report we illustrate the application of ellipsometry to the characterization of nanoparticle based samples. Our goal is to demonstrate that the technique can apply within a large panel of materials science. 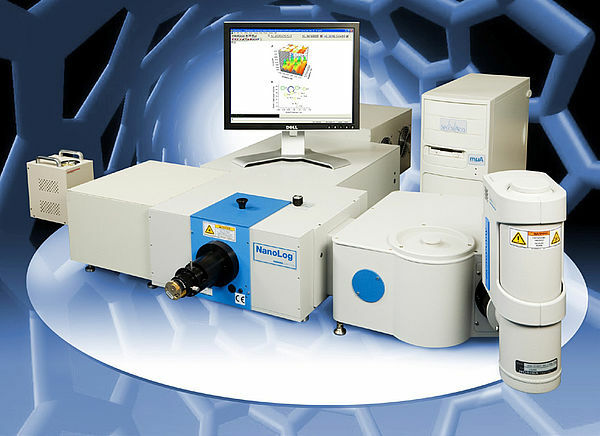 The HORIBA ellipsometric product line offers the most versatile hardware of the UVISEL series combined with the DeltaPsi2 software including unique modeling features to get the most of your applied work on this fascinating domain of modern physics. Nanophotonics is one of the most exciting new fields to come out of nanotechnology. The quantum-confinement effects observed in these very small (~10 nm) particles can lead to unique optical properties. 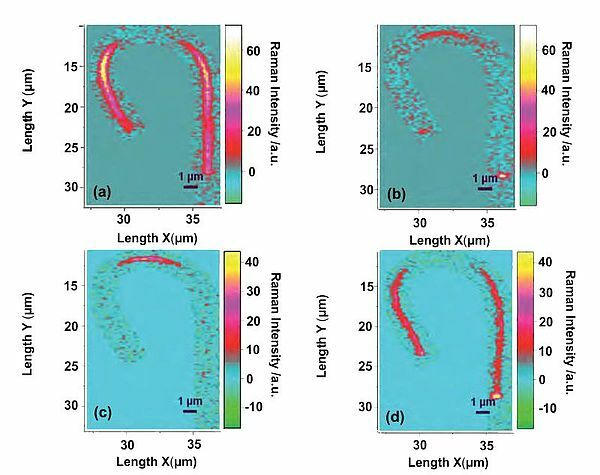 We have performed a complete Raman polarized study of a single GaN nanowire using a confocal microscope together with a high resolution stage. The high spatial resolution of our Raman confocal instrument together with a piezoelectric stage demonstrates unambiguously the possibility to image the optical properties of nano-objects with a resolution better than 200 nm keeping the fill advantage of the polarization control under a confocal microscope. 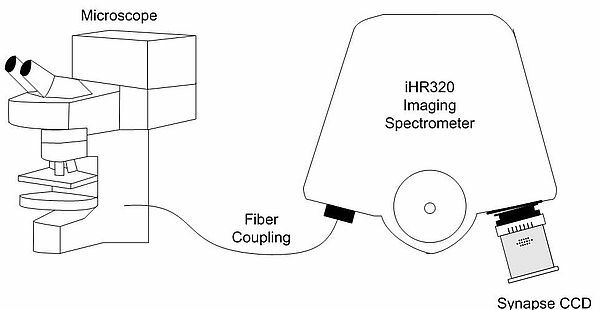 Improvements to the HORIBA Scientific NanoLog®, already the best spectrofluorometer for exploration of single-walled carbon nanotubes (SWCNTs), render it even more suitable for this application. Research in nanoscience has garnered much interest because of the different properties of small structures compared to the respective bulk material. 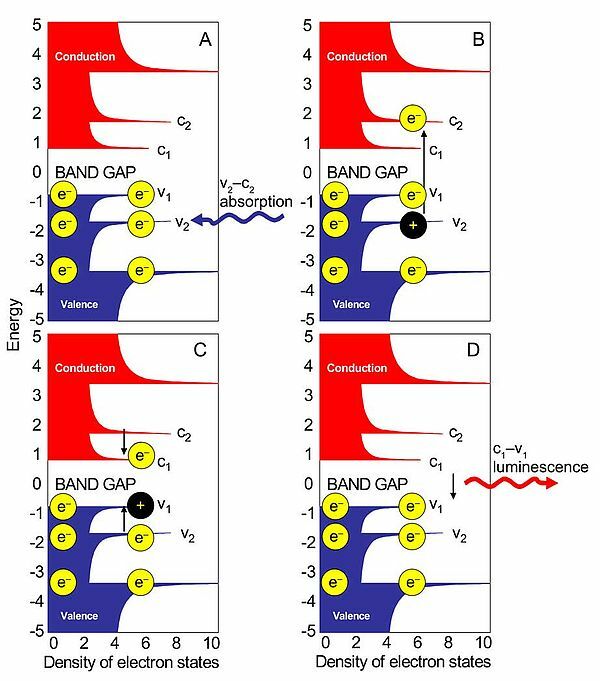 InGaAs/GaAs and InAs/GaAs quantum dots (QDs) have been identified as suitable candidates for various applications in the terahertz range by using their intraband carrier transitions. 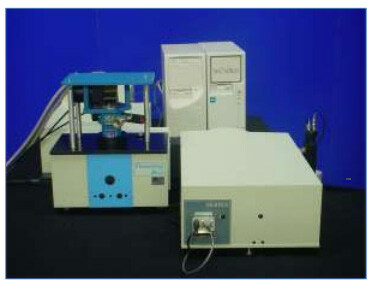 The NanoLog has a reputation as the premier instrument for the exploration of single-walled carbon nanotubes (SWCNTs). 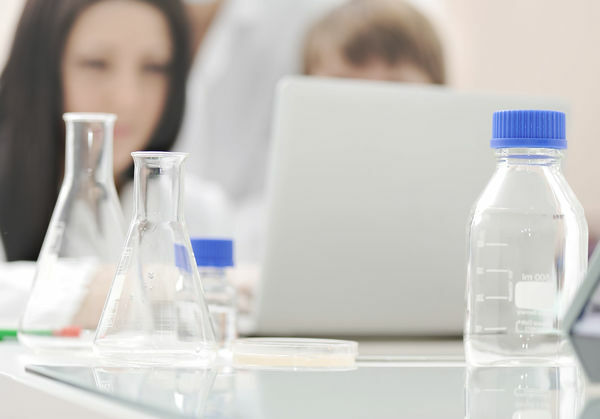 Silica is currently one of the most important industrial materials, whose nanoparticles are formed via a sol-gel process. 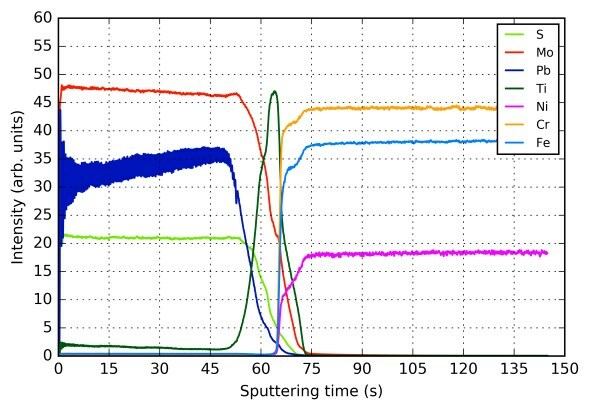 HORIBA Jobin Yvon’s spectrofluorometers have many applications in nanophotonics research: single-walled carbon nanotubes (SWNTs), quantum dots (QDs), and organic light-emitting diodes (OLEDs). Quantum confinement affects nanomaterials’ photoluminescence: when the semiconducting nanoparticle is smaller than the bulk material’s Bohrexciton radius, the bandgap energy is inversely proportional to the nanoparticle size. Quantum dots (QDs) have potential applications in optoelectronics, biosensing, biolabeling, memory devices, and sources of laser light. 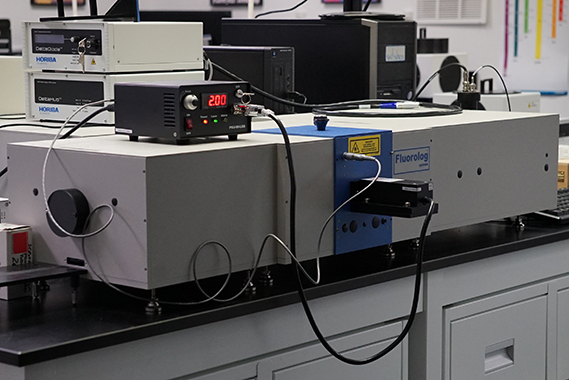 HORIBA Jobin Yvon’s NanoLog® spectrofluorometer, specially optimized for recording near-IR fluorescence from nanoparticles, includes a double-grating excitation monochromator, imaging emission spectrograph with a selectable-grating turret, and a variety of detectors. 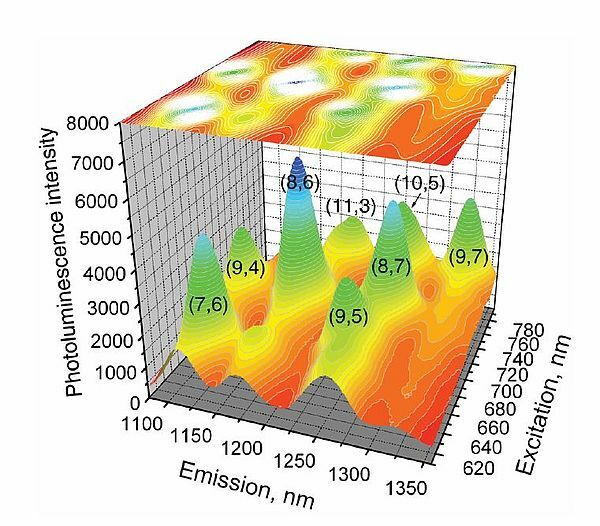 Corrected emission spectra1 of carbon nanoparticles can provide excitation–emission matrices (EEMs) for a range of excitation wavelengths. Single-wall carbon nanotubes (SWNTs), consisting of rolled-up single sheets of carbon atoms, have received much attention recently.